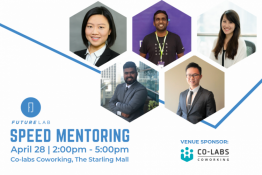 Futurelab is hosting a Speed Mentoring event with five awesome mentors with varied experiences to help get you ready! 1. Book a 40 minute Speed Mentoring Session with a mentor. 2. Each mentor will have two (2) open 40 minute slots. You may only purchase one (1) slot, per mentor. 3. Come prepared with questions, CVs and resumes and topics you want to cover with your mentor! 4. After your Speed Mentoring session - join in on the networking session with other FutureLab mentors!